Focus: Any peace officer serving as agency trainer. Length: 40 hours. Agency option: four 10-hour days, or five 8-hour days in length. As an instructor course, this course is not about you. It is about training you to train your officers to be effective and to save their lives on the street while meeting constitutional requirements of objectively reasonable force. Problem-solving is the foundation of all effective fighting--"techniques" just aren't successfully applied like on the mat--you knew that the first time you ever tried to apply that nifty wrist lock to someone who didn't understand how cool the technique was. The last fight you were in required you to figure out--under threat--how to take the suspect into custody. When it comes to fighting, how do you learn to successfully "problem-solve" against a bigger, stronger, determined suspect. As an instructor, more importantly, how do you teach others to problem-solve? This truly revolutionary concept forms the basis of the most effective method of teaching armed professionals to prevail in the very short period of time permitted for training. 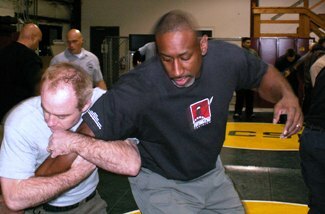 Centering on "Integrated Combatives Problem-Solving"© featuring the "Universal Rules and Principles of Combatives"©, the application of simple yet effective physical skills, "Applied OODA Theory"©, through the application of current legal and policy provisions for the force response, creates the formula to achieve problem-solving competency. Did the officer prevail (preferably uninjured)--or, at least, survive? Did the outcome of the incident meet constitutional, legal, and policy standards? Was the officer able to take the subject into custody? If the answer to each of these questions is "yes," then the officer did his/her job, and we did ours. We teach officers to do what officers do best: problem-solve force responses within a constitutional framework. Average officers practice little and generally remember almost nothing of their complicated, martial arts-intensive training. Strong, skilled men generally develop training that is suited for big, strong, skilled men...however, this system works for them until they are confronted by another big, strong, skilled man--then they will need to problem-solve their way through this fight. All of your officers appreciate this system for its simplicity and tactically-sound approach to increasing their ability to effectively put hands on a resistive or even combative subject. Highly trained officers appreciate the depth of the system in answering questions of why they have been successfully performing--and for increasing their abilities to apply their previous training. Big or small, strong or weak, highly trained or relatively less-trained...all benefit greatly from our problem-solving approach. The "Integrated Combatives Problem-Solving: Train-the-Trainer" course is highly structured in its concept, with each block of instruction layered upon the foundation of all physical conflict problem-solving: the "Universal Rules and Principles of Combatives. "© As the new instructor learns the concepts involved with Defensive Tactics, and then teaches it, the foundation for Police GroundCombatives training is laid. Police GroundCombatives leads to Arrest & Control, which leads to Real-World Weapon Retention, and so on through the entire course. Outcome-based: We train officers and their agency trainers to respond to every day threats --as well as extraordinarily dangerous circumstances--by employing "Integrated Combatives Problem-Solving"© featuring the "Universal Rules and Principles of Combatives,"© and "Applied OODA Theory. "© The only determination of whether the officer's method of defense and control was "correct" is that the officer was not injured and survived, and his/her force response was legally reasonable and within policy--just like in the real-world of force evaluation and justification. Gross-motor skills dependent: We never forget that these lessons are applied in the real world of fear and hazard and consequence, where nothing ever goes as planned. We have the only system that depends solely upon gross-motor skills in our combatives problem-solving efforts. We employ zero techniques to be forgotten a week later. Instead, we provide simple to employ, effective skills that have a high likelihood of success in any combative circumstance.